Everything you need for a thumb-thumping throwdown! Thumb wrestling is such a time-tested, universally admired life skill for kids that, frankly, we're surprised by how long it's taken for it to get the Klutz treatment. But there is no rushing the awesomeness that is the Sleeve of Doom. Sleek, shiny and sensational, the Sleeve of Doom is the ultimate instrument of combat. Two contenders slide their hands in and clasp them together, poking their thumbs through the holes. The sleeve prevents cheating by locking the hands in place. Thumb Wars: The Ultimate Guide covers everything from classic challenges, strategies and training exercises to fake-outs, trash talk and never-before-played games. Since image is everything in the wrestling world, some clever thumb names and flashy costume ideas are also included. There's even a handy referee guide and score cards. 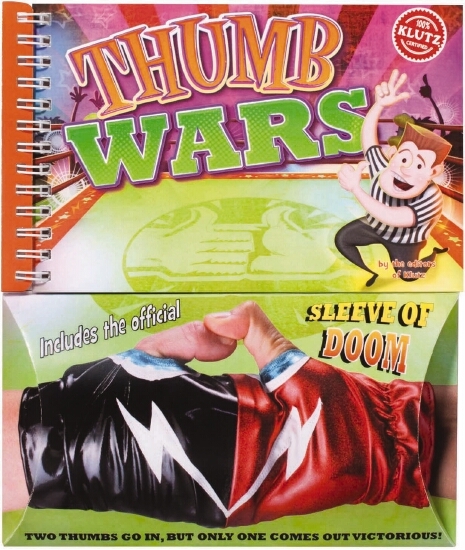 All of which makes Thumb Wars: The Ultimate Guide more than just a book. It's the official rules of thumb.